Stylish new ‘KODO – Soul of Motion’ design features enhance its quality look and feel. And the Mazda CX-5’s unique body lines can now be admired in the new Sonic Silver Metallic, one of nine available body colours. Mazda CX-5’s interior is spacious and inviting, with room for you and your passengers to stretch out and anticipate the exhilarating drive ahead. Superb craftsmanship with soft surfaces and high-quality materials, chosen for comfort and enduring quality, combine to create a feeling of contentment and well-being. The Mazda CX-5 figures are indeed impressive: At 4.6 l/100 km (61mpg ) and 119 g/km, the CX-5 with SKYACTIV-D diesel engine has combined cycle fuel economy and CO2 emissions that are among the best in its segment. Mazda's pursuit of creating a more environmentally friendly SUV has not come at the cost of superior driving dynamics. The all-new CX-5 is the driver’s car ensuring you enjoy every journey behind the wheel. SKYACTIV Technology ensures impressive performance and handling, without compromising on efficiency. 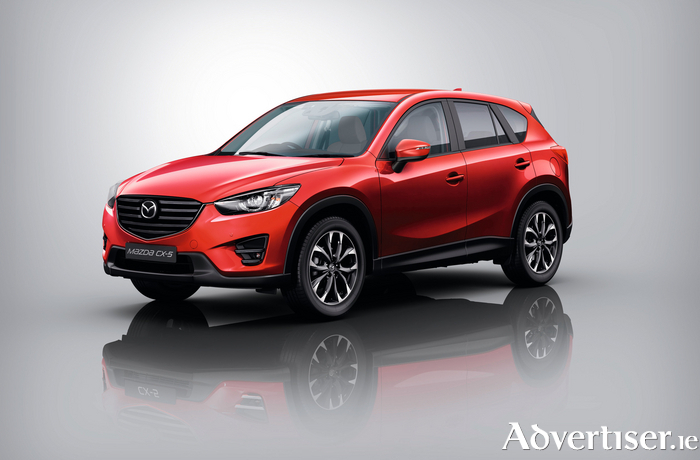 The Mazda CX-5 is not only fun to drive, it also offers you peace of mind with its i-ACTIVSENSE safety features. And the latest innovative MZD Connect – Mazda's mobile connectivity system – will give you easy access to everything you need, from music to navigation (Optional ).